Coatings for the Medical Environment. At e-coat, we provide a full range of concrete and associated floor finishes for the medical environment – including the latest polyurea polyaspartic concrete floor coating systems. We have extensive experience in the medical environment and we help our medical clients achieve the following results. Improved hygiene with less risk of infections; our floors restrict bacteria growth and the accumulation of dirt and other contaminants. Lower maintenance and labour costs using the latest easy-to-clean coatings. Aesthetic appeal with a variety of decorative finishes. Improved safety with our non-slip surfaces. Reduced moisture after cleaning – restricting bacterial growth. For a free consultation at your medical facility, call us now on 0447 774 004 or contact us here. Experience in the medical field. Ask for references. 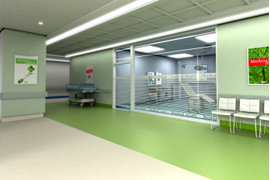 Proven Results with medical floor coatings for medical applications. Speed. We can install and refinish floors quickly – minimising downtime. Lower Maintenance Costs…once your floors are installed, cleaning becomes faster – reducing cleaning costs. Sydney’s top experts so the flooring work is completed on time and on budget with no surprises.